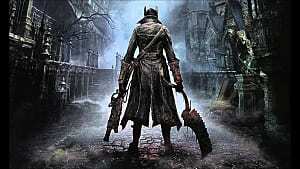 As a fan of adventure games, I'm always looking for things with addictive gameplay, memorable characters, and epic stories with twists and turns that make me sad when the adventure ends. I've been a Legend of Zelda fan for at least a decade, and I had heard about Okami being similar. During a recent visit to my local GameStop I picked up the Wii version. Let me tell you, I was not disappointed. 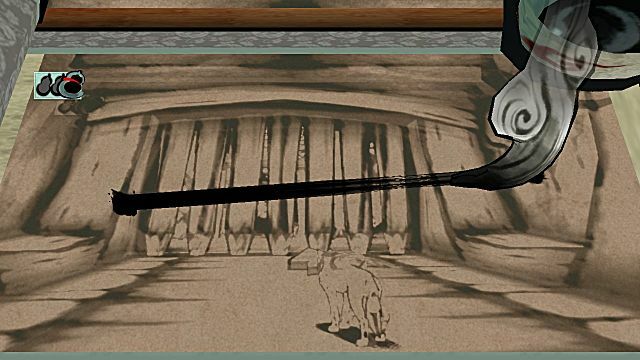 One of Okami's most notable features is the Celestial Brush. Your screen becomes a canvas, and your drawing comes to life in the game's world. Or at least that's how it's advertised. The brush in the Wii version can be temperamental at times and refuse to do anything. For example, at the beginning of the game you have to fix a broken statue by drawing the missing sword. Took me longer than it should have, it was horrible. I later mastered the brush, but there are still times when it gives me trouble. There are thirteen different brush techniques that you unlock throughout the course of the game. The one I just described is Rejuvenation, also used on broken bridges and anything broken or missing. Bloom brings a wilted tree back to life. Power Slash is a useful battle technique. Cherry Bomb blows up cracked walls so you can pass through. Catwalk allows you to climb walls. There are many others. Battles take place in closed in areas, there is no hiding behind trees or boulders or sniping from a distance like in Zelda games. You can use items like exorcism slips to do some easy damage to your enemies, vengeance slips to temporarily be immune to attacks, and of course there's healing items. There are three different types of weapons: reflectors, rosaries, and glaves. You start out with a reflector, very basic weapon. When you get a rosary you get the ability to hit your enemies from a distance, still being in the enclosed arena though. Glaves pack a punch but are slow and can't do ranged attack. You have two weapon slots and yes, it does matter which slot a weapon is in, a reflector in the second slot becomes a shield for example. 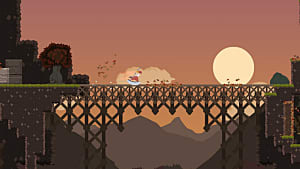 Various brush techniques can also be used in battle and they're even required for some enemies. 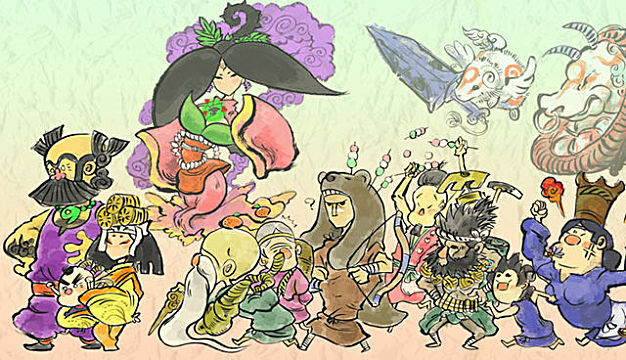 Okami has a great cast of characters, here are some of them. 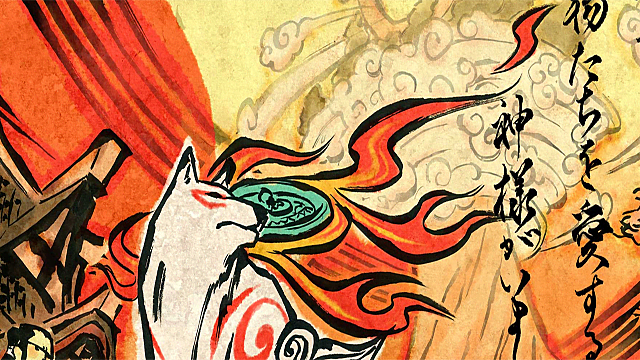 Amaterasu: The heroine of the story, a sun goddess who takes the form of a white wolf with red markings. She's not at her full power and must gain back her abilities one by one. Issun: A member of the tiny poncle race, he travels with Amaterasu who he has affectionately nicknamed "Ammy" in an effort to master the Celestial Brush techniques. Susano: He's descended from the legendary warrior Nagi, but he's lazy and frequently in over his head. The villagers expect great things from him, but can he live up to his heritage? Kushi: A beautiful and talented sake brewer. Her sakes are so good that people come from the city to try them. She is brave and independent despite her delicate appearance. Waka: A mysterious figure with the gift of prophecy. He's often crossing paths with Amaterasu and Issun, calling Amaterasu "Ma Cherie" and annoying Issun. His prophecies are on the mark, but he rarely does anything to help. Orochi: An eight headed snake demon. He was defeated a century ago by Nagi, but he's back and with a vengeance. He is but one obstacle that Amaterasu must overcome. 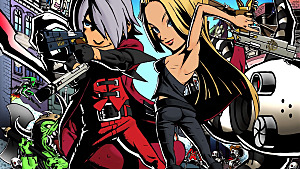 The story starts off simply, with little character development and anything notable in general. But once you get past the first half of the game, it kicks it into overdrive. 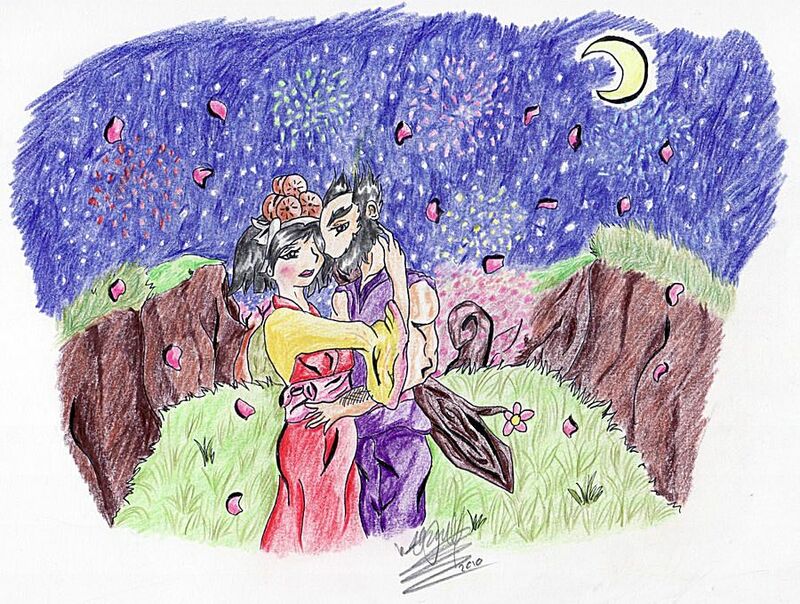 I found myself cheering for Susano and Kushi and wanting them to just get it on already, they made such a cute couple. (Need proof? 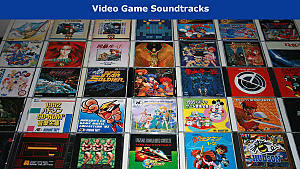 Look at the image included with this section.) The story had a few twists that I didn't expect. Some plot elements are optional. You can do a sidequest to find out more about Waka for example. And Issun's wisecracks? Totally worth hearing. Don't skip dialogue. Also worth noting is the many nods to Japanese mythology. The game's manual explains the references and they are done in a clever, unique way. 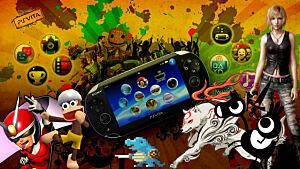 The graphics are meant to resemble ancient Japanese woodcuts. They work well with the game's theme, but they can be confusing at times. For example, I wasted time in the village pond because the bottom of the waterfall looked like the thing that appears at the edge of an area leading to another. I thought I'd found a secret area. 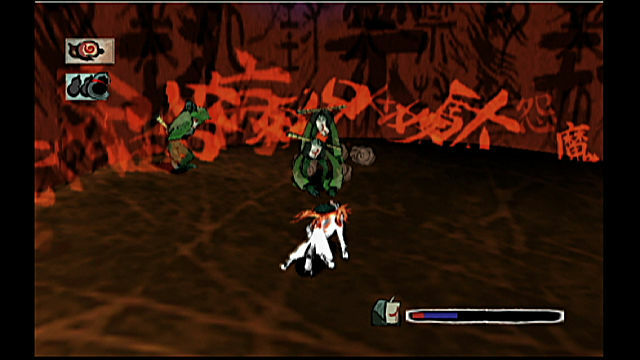 Another thing that I found odd: when you hit the ground after jumping, no matter what you're landing on, leaves scatter from under Amaterasu's paws. These are minor nitpicks though. The visuals have a kind of beauty to them. The music, as expected, has an Asian flair. 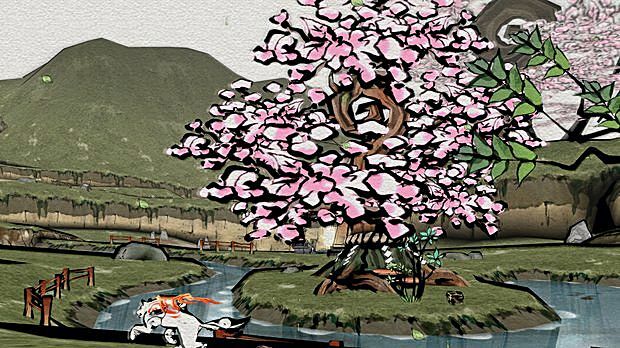 There are plenty of soothing tracks that make you picture cherry blossoms floating in the breeze, but Okami isn't without its epic tracks and tracks that sing of impeding doom, or tracks that sing of hope in the face of evil. My personal favorites are Battle With Orochi II, Kushi's Ride, and the ever popular The Sun Rises. 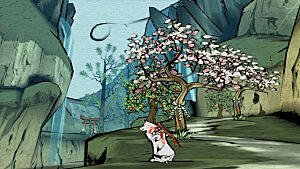 I give Okami a nine out of ten. Don't let the wonky brush controls scare you away. 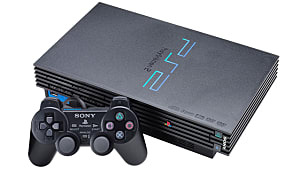 There are also versions on the playstation 2 and 3 if you're not willing to get used to the motion controls. 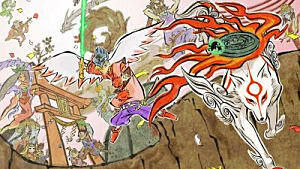 If you love Legend of Zelda, you will love Okami! Okami is highly recommended for fans of the action/adventure genre. It is similar to the Legend of Zelda series. But the wii version has a few hiccups.